When it comes to the tower fan vs box fan debate, as usual, it will come down to what your desired use is. Box fans are much cheaper and can be used in a multiple of ways with a little handy work, are more portable and they are also easier to maintain. Tower fans have much more features and convenience with remote controls and will move more air than a box fan along with having much more aesthetically pleasing options. Below we run through all the pros and cons of a tower vs box fan. Box fans are quite compact thanks to their shape. They usually come in rectangular shapes but you can find circle-shaped ones as well. They are compact and easy to move around, meaning you can carry them easily and place them wherever you need them to be. The plastic grill keeps you protected from the blades when carrying the device. Box fans have higher CFM than window fans. They are good for getting rid of smoke, dust or odors from a room, especially if you place them near a window so they can push the air out of the room. Some models of box fans are more powerful than others, but most of them will get the job done well. Box fans are much cheaper than most tower fans. If the price is an important factor in your decision, box fans are way more budget-friendly than tower ones. But remember, you do get what you pay for so expect them to be less versatile and flexible than tower fans. 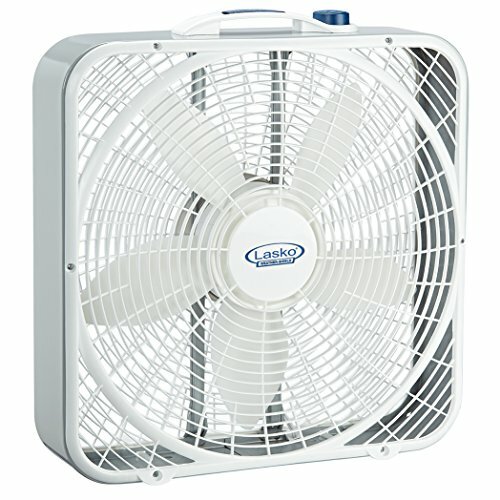 According to Lasko box fans can cost as little as 2 cents per hour to run. This makes box fans extremely cost-effective in certain scenarios. According to homeguides using a box fan in a window can help draw in cool air from outside, or if the fan is reversed you can draw the warm air out of the room. You can setup box fans in windows to use the air at night to cool your house. This means saving on AC fees during the day and also taking advantage of low power prices at night. If you are DIY inclined you can turn your box fan into a box fan filter. Because they are quite cheap, box fans can be replaced without spending a lot of money. They are also easier to maintain and you won’t need professional help in case of a malfunction. Each fan comes with an instruction manual that should be enough to inform you on how to maintain it. When it comes controlling the direction of the air coming from a box fan, sometimes you don’t have many options. Often, the only option you have is letting the air blow in a straight line in front of the fan. If you want to change the direction of the airflow, you will have to move the fan and position it so that it suits your needs. A lot of box fans don’t have any rotation features, which is quite an issue unless you plan to use the fan in one spot only, blowing only in one direction. Box fans are indeed very noisy. Some models will obviously be louder than other, and always read the reviews as the feedback will generally state whether the noise is an issue for purchasers. If you want a fan that can keep running while you sleep, a boxed fan may not be the right option for you as it is very loud and also lacks remote control and mode features. Box fans have no oscillation feature and different wind modes, let alone other fancy features such as ionizers and timers. What you get with a box fan is pretty simple: a powerful airflow running in the direction you turn the fan too. If you need a fan with more features, you definitely shouldn’t settle for a box fan. Box fans definitely don’t fit in interiors where design and appearance are important. They stick out and they’re kind of an eyesore when placed in well-designed homes and offices. If you care about the looks of your space, maybe a box fan isn’t the right choice for you. When it comes to tower fans, you have a wide range of pricing options available. Even though they are more expensive than box fans, you can still choose between higher and lower priced devices. Having this freedom of choice when choosing a price is a great thing for your budget, but remember that you get what you pay for. Even cheaper options have a lot of features to offer but they are probably of less quality than the more expensive ones. 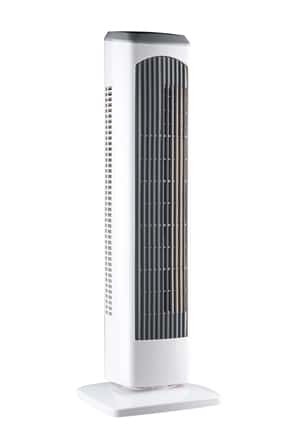 Because of their shape, tower fans can fit corners and narrow spaces. The settings available on these fans allow you to adapt it to the size of the room it is operating in. If you’re in a larger room, you’ll need more airflow so you simply turn up the power, whereas if you’re in a smaller room, you can tone it down and adjust it the way you like. The base of tower fans is not too wide so it can both fit smaller spaces and be stored in such. Possibly the greatest thing about tower fans is that they offer a lot of cool features you can play with. Those include a nightlight, an ionizer, different speed settings and different modes such as breeze mode or sleep mode. Most tower fans also have a timer that allows you to set for how long the fan will be operating. This is especially convenient if you’re going to leave the fan running while you sleep. Some tower fan models offer the air purification feature which creates an overall healthier environment. This is very useful to people who suffer from asthma or different allergies and it is exceptionally good to be used if you have children living in the house. Even with so many features within one unit, tower fans are very safe to be used in home environments. The blades are well protected and they have a very steady base so they won’t be knocked down easily. These fans can suit different environments well, as they have a more modern design than box fans. They definitely won’t ruin the décor of your room if you decide to place them in a corner or by the sofa. Even though tower fans offer many great features, including the air purifying ionizer, they are not a replacement for an air conditioning device. 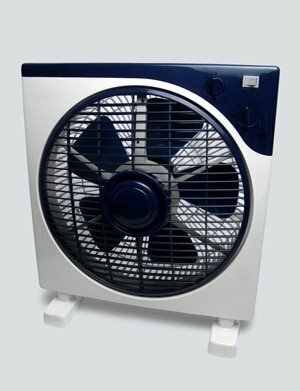 If you are looking for the effective cooling of the AC, an actual AC device is the only device that can deliver such power. Therefore, even though these fans do a great job at refreshing the air, they cannot replace ACs. Unlike with box fans, if a tower fan malfunctions, you will need a professional electrician to come and take a look at the device or you will have to take the device to a specialized service to get it fixed. Either way, don’t try to fix it on your own unless you have experience with electrics and tower fan units. When it comes to maintenance, box fans win the battle. The durability of a tower fan largely depends on how much you pay for it. Some models are more durable than others but they are also more expensive. If you’re looking for a fan that is going to function for a longer period of time, don’t choose the cheaper tower fan options. Besides, if you invest in quality once, you won’t have to pay for new fans anytime soon. If you are looking for a fan that is portable, cheap, low maintenance and versatile in its application (with a little DIY) then a tower fan might work well for your needs. However, if you’re more in need of a convenient fan that can be used in different sized rooms, controlled remotely and can rotate according to need, tower fans are the right option for you. If you are concerned about aesthetics and how a fan might fit with your decor, tower fans provide many more options for you. Think about which fan types suits your needs best, according to room size, type of use and the aesthetic. If you have the budget in mind, box fans are definitely cheaper but remember, investing once in a higher quality tower fans means saving money on future purchases of fans for a long time. 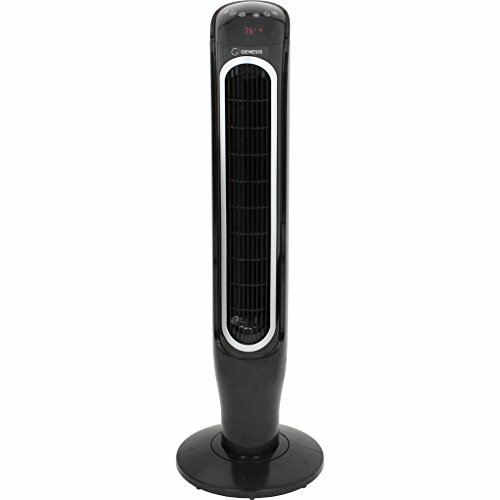 If you are looking for a mix of a tower fan and a box fan, you could potentially look at a pedestal fan and see how they fare against a tower fan. Of if you are looking to find the best box fan check out our in-depth buyer’s guide. Have you purchased a box fan or tower fan? let us know your experiences by leaving a comment below.